There is a certain class of “transportation expert” that does just one thing: poo-poos rail projects. The Reason Foundation in particular has found a niche issuing easily discredited doomsday reports on local rail. These folks travel around the country as hired guns, and they’ve been recruited by politicians in North Carolina. The Triangle region of Raleigh-Durham-Chapel Hill is laying the groundwork for a light rail system between the three cities. According to Mary Newsom at the Naked City, just one community is holding out: Wake County, which has enlisted a team of “experts” to weigh in. Newsom says the deck is stacked. Wake County commissioners, dominated by Republicans, have stalled and stalled. Then they hired a three-person panel of “experts” to look at the local data and provide advice. One of the experts is Sam R. Staley, well known in planning circles as an anti-Smart Growth voice. He’s a research fellow at the Reason Foundation, a libertarian public policy think tank. Among those on Reason’s board of directors is David Koch, the billionaire oil industry mogul and conservative activist whose money in part has helped bankroll the Tea Party, among other political endeavors. But I digress. Another of the three experts is Steve Polzin, director of the mobility research program at the Center for Urban … Transportation Research at the University of South Florida. 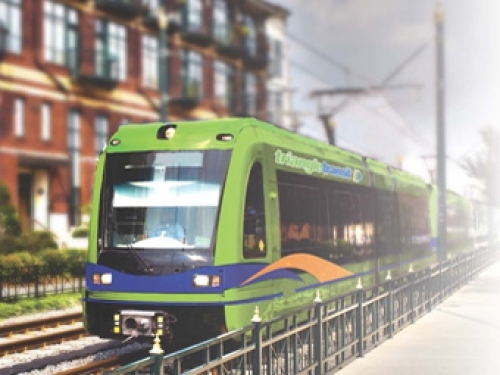 A Tampa Bay Times investigation in 2009 found that the center has frequently been critical of passenger rail travel, while promoting alternatives (highways and bus rapid transit) that it has been paid millions to study. Read it here: One of rail’s biggest critics gets millions to study and promote alternatives. Elsewhere on the Network today: ATL Urbanist comments on the the Braves’ move to the suburbs and the shifting definition of “Atlanta.” Rails to Trails explains Michigan biking advocates’ push to impose criminal penalties on drivers who kill or maim cyclists. And Delaware Bikes outlines a new federal effort to reduce biking and pedestrian fatalities.